And to close out your 2014 experience, we have a brand new Albert the Alien ready for your reading pleasure! 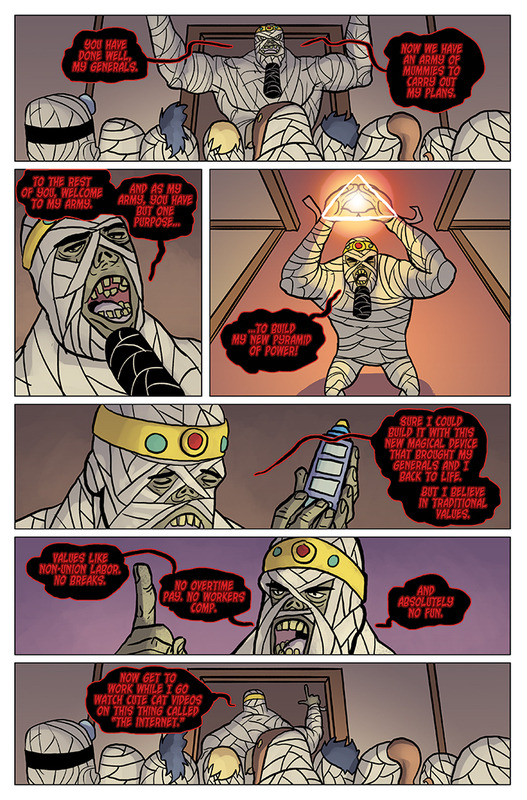 The Mummy King reveals his evil plot to regain his former glory, and re-create his empire of power. Of course, this would be a bad idea. Because, you know — a mummy ruling the world with crazy rules like no dessert, or no video games would be awful! Plus, he would probably make us all his mummy army slaves. So can he be stopped? We’ll find out next year (which is Friday this week), in the next Albert the Alien update! Hey gang, 2014 is quickly coming to a close – but I’ve already figured out a good chunk of my convention appearances for 2015! Including this one: Kollision Con! The show is January 2-4 in Rosemont, Il. This will be my first appearance of 2015, and I’ll be joined by many other talented comic creators (who I also like to call my friends). I’ll be in artist alley selling books and art, and I’ll also have a number of panels throughout the weekend! This is a fun show to start the year with, and I hope to see you there!